We’ve been enjoying the warmth under the sunshade on the patio, trying not to move about too much. And whenever I come indoors this refreshing vase, full of frothy zing, catches my eye and has a nice cooling effect. And the work was all done by my sister this week, so thanks go to her and to Cathy at Rambling in the Garden for hosting this lovely meme. Grab a cold drink, preferably with ice and lemon, and enjoy the slide show! This entry was posted in Garden, In a Vase on Monday, Plants and tagged Cut Flowers, Garden, Summer. Bookmark the permalink. A lovely cool ‘ Tonic’ to go with the Gin on a summers day,Cathy. I like the white Sweet William, I have just planted some seeds for the first time this year, I hope they look that good next year. Beautiful vase of flowers Cathy. Well done to you and your sister! Thanks Gillian. It’s still looking cool and refreshed, unlike me in this heat! A very pretty vase, Susan! Flowers are harmonizing so very well in colours and shapes.Love most the pure white “Sweet William” and the dainty “Alchemilla mollis”. I love the icy yellow of the Alchemilla and the Aquilegia. The video is a great tool to highlight individual elements too. I hope you get a cool breeze. It’s been hot here too – in fact, it seems to be hot almost everywhere in the northern hemisphere. Lovely vase and nice mix of blooms. The Sweet William is beautiful. Thanks Susie. The Sweet Williams do last well too. Ich habe mir gerade einen kalten Grünen Tee mit Mango geholdt und genieße deine Diashow. Sie ist sehr gut gelungen! Schöne Sommertage für uns alle. Enjoy sitting in a shady place today Uta… it’s getting hotter! It is a lovely time of year for the garden. I hope the heat won’t last too long or everything will be shortlived! Oh lovely – thanks to you and your sister for sharing. Just what we need today – and isn’t alchemilla a great complementary filler for a whole range of vases? It seems the UK is getting some heat too…. I think I need to make some ice cubes as it is over 30 again here! Phew! Stay cool Cathy. Stumbled on your blog and this refreshment is just what I needed! It’s been upwards of 90F here in the Northwest–definitely not our usual. So your images are quite welcome. I love the “froth” of the Alchemilla! Great word. And while I usually find yellow flowers warm, that Columbine is deliciously cooling. Everyone seems to be in the same situation right now. It is so hot again here today but the vase is still looking cool! Thank you for visiting Emily! This is lovely Cathy, and lovely too that your sister is visiting. We are due a mini heat wave here, up to 33 on Wednesday so we are bracing ourselves! How do you create the slideshow? We had 33 Tuesday and a scary 37 is forecast for the weekend…. The slideshow is part of the options in my theme, and is offered when I open my media library. Yikes, we are moving up to 35 today, it’s humid though and then breaking tomorrow. Hopefully your weather will break too, 37 is way to hot. What a lovely vase, Cathy, looks so ”refreshing”! Thank you Anca. Is it hot in your part of the world too? That vase is a breath of fresh air on a hot evening! 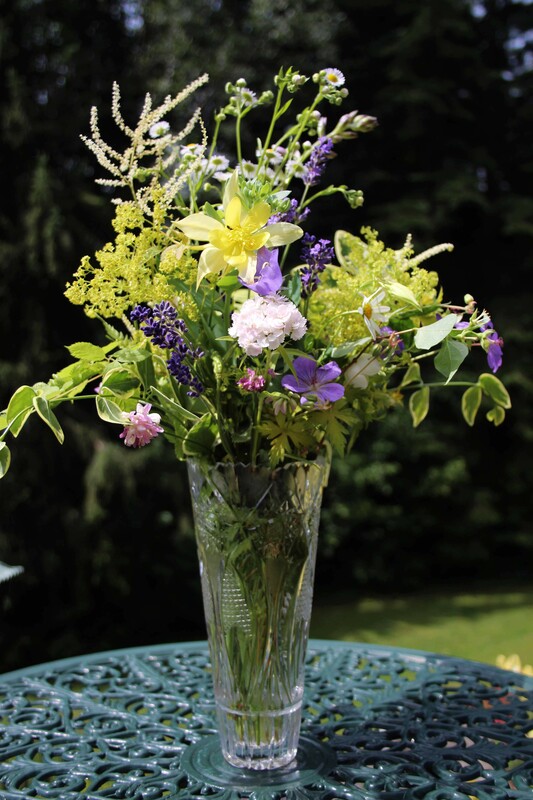 The flowers all look so lovely together and would be perfect to accompany a cooling gin & tonic. Thanks Donna. The Goat’s Beard goes over so quickly if it’s hot, so that and the Alchemilla are great vase fillers. I LOVE that lemon yellow aquilegia! Thanks Debra. It’s lovely having my sister here and taking a break from gardening and other chores! I just wrote about the heat, too. It’s oppressive. This gorgeous vase is so inviting, Cathy. It’s like a cool glass of lemonade and a wonderful collaboration between you and your sister. I hope you’re enjoying your time together. That sounds like an excellent strategy. Feeling the vibe of your vase, I love the aquilegia! The aquilegia is a beauty. Hope you aren’t suffering in a heatwave like everyone else seems to be! How effervescent! It really works as a visual cooler. Lovely. A lovely word to describe it! Yes, it does help cool me down when I look at it, and is lasting well indoors too. So pretty and fresh! And perfect vase for such a sugary confection! Thank you Marian. We need cooling down here right now! Thanks Sheryl. Hope you are having summery weather too! Oh yes please to the ice and lemon Cathy. I’m glowing! Your sister has conjured up a most cooling visual treat. I will be interested to hear how long the geraniums fare in a vase. I was most impressed by campanula when I picked it. Thank you Bec. That was exactly her intention to make it cool and restful. Yes, hot here too. Enjoy the rest of your heatwave! How refreshing, but I’m surprised you cut another one of the yellow aquilegia… although it’s sometimes nicer to enjoy them closer to where you’re sitting, especially if it’s so hot! Here we have been on the cool side with almost daily rainstorms. I’m not going to complain, but it does bring on the bugs! Well, I gave my sister a free rein and she obviously liked the aquilegia too. They were flowering so well until the heat hit…. the biting insects are terrible here too! How beautiful, Alchemilla mollis makes such a lovely frothy setting for your pretty arrangement. I hope you are having a lovely time with your sister. Thank you Chloris. I have enjoyed my sister’s visit immensely. Alchemilla is still looking good in the garden, but this heat is beginning to frazzle everything out there! Same here. Oh for a bit of rain. I love the sunny weather but oh dear, the poor garden is gasping. Love the vase that your sister created, it does have lovely cooling colors.